Today we are going to discuss one of the most common Physical Therapy issues in America, posture. Poor posture is something that we all can relate to, as most of us suffer from it in varying degrees of severity. I’m sure you can all remember at some point or another when you were growing up, or even yesterday , where someone told you to “stop slouching” or “sit up straight”. For myself, as a child, it was always my mother bugging me to sit up straight. It’s as if mothers have some kind of instinctual training on fostering proper posture in their children. Well, little did how know how right my mother was or how important that nagging would become to me in my future. Now, 20 something years later, as a Physical Therapist, I have quite a different perspective on the topic. Posture has always been an important focus of health and wellness, but with the societal and technological changes, its importance continues to grow. Our society has created an environment that facilitates more sitting, computer use, and cell phone use than ever before. Far too many of us literally sit for a living. This excessive sitting is leading to structural changes in our body that cause poor posture and are related to a number of injuries we treat here at Hands On-Austin. Physical Therapy has gone so far in our analysis of posture, that we have named an entire syndrome exclusively to describe poor posture, called Upper Crossed Syndrome. Upper Crossed Syndrome was first described by, Dr. Vladimir Janda, a Czech Neurologist and Physiatrist. 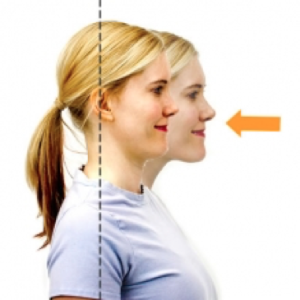 The Janda Approach describes and predicts patterns of muscular imbalances that we see time and time again in our patients who have poor posture. 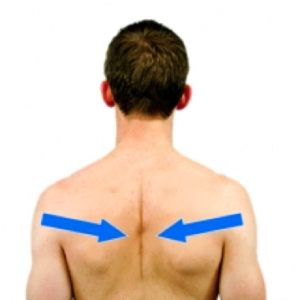 It includes the common areas of muscle tightness and weakness that are associated with this Upper Crossed Syndrome. So, you may be thinking what is Upper Crossed Syndrome exactly? 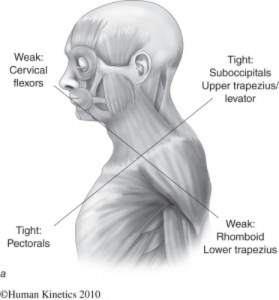 It is described as chronic tightness in the muscles of the back of the neck and shoulders called the upper trapezius, levator scapulae, and sub-occipital muscles that crosses with tightness in the chest muscles called the pectoralis major and minor. 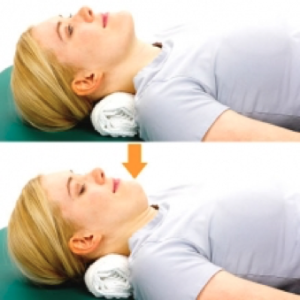 It also includes weakness in important muscles in the front of the neck called deep neck flexors that crosses with weakness in the upper back and shoulder blade muscles, most specifically your rhomboids, middle trapezius and lower trapezius muscles. This combination of crossed tight muscles and crossed weak muscles is what we describe in Physical Therapy as muscular imbalances. Now you should be thinking, what does upper crossed syndrome look like or how do I know if I have it? An individual with upper crossed syndrome will present with forward head posture, increased curve of their neck, rounded forward and elevated shoulders, winged shoulder blades, and a rounded upper back or hump back. These muscle imbalances and structural changes accelerate joint damage in the neck, back, and shoulders, lead to development of myofascial restrictions and trigger points within muscles, which ultimately leads to abnormal movement patterns. All of these changes in our body have been associated with the development of neck pain, back pain, shoulder pain, headaches, migraines, TMJ pain (jaw pain), muscle pain, and thoracic outlet syndrome (commonly presents as numbness and tingling into the hands and fingers). 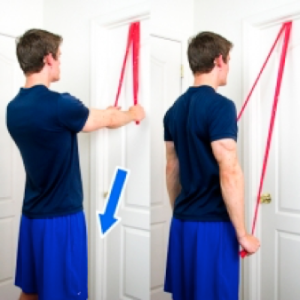 Remember, that anyone who has poor posture is at a higher risk of experiencing any of the above injuries. Since, we all have poor posture in some way or another, we are all at risk of these injuries. Therefore, it is important for all of us to make changes aimed at improving our posture. The first step to any problem is identifying that there is one. If you sit for any portion of your day, it’s likely that you should be thinking about ways to prevent or correct upper crossed syndrome. That includes anyone who works at desk, sits at a computer, drives a car or truck, travels regularly, watches TV or movies, and uses their cell phone. 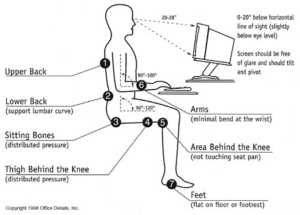 If any of the above activities remind yourself of you, then you could benefit from improving your ergonomic setup. The overall goal of an ergonomic setup is to properly align your body and posture to minimize stress and strain on your muscles, bones, and joints. If you have been dealing with poor posture or working a sedentary (or inactive) desk job for any amount of time then it’s likely that you have experienced one of the previously mentioned injuries. In this case, you could benefit from being evaluated and treated by a healthcare professional. Physical Therapists and other healthcare professionals have been extensively trained in methods to evaluate and treat injuries associated with upper crossed syndrome. We are able to develop comprehensive and individualized treatment plans aimed at correcting your specific form of upper crossed syndrome. This is done by determining the underlying cause(s) of a your injury and treating your body as a whole interconnected system instead of one isolated area of pain or injury. Healthcare professionals have determined that injuries often develop due to dysfunction above and below the area of actual injury. Therefore, only treating the localized area of pain or injury may not actually be addressing the underlying cause of that injury. This means that the patient may not get better or may be predisposed to reinjure down the road. A comprehensive treatment plan created specifically for you facilitates treatment that includes manual therapy, exercises, and stretches to correct and reverse your specific postural abnormalities. At Hands On-Austin, manual therapy includes myofascial release, spinal manipulation, joint mobilization, soft tissue mobilization, and manually resisted exercises aimed at correcting muscle imbalances to improve movement patterns and restore function. 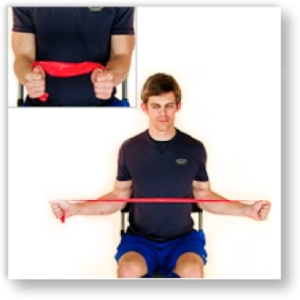 In short, addressing upper crossed syndrome includes stretching the tight muscles, strengthening the weak muscles, and globally increasing your postural awareness throughout daily life. Although, that sounds simple, it is important to know exactly what to stretch and what to strengthen so you can correct imbalances. 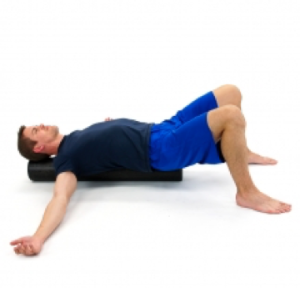 Exercising and stretching incorrectly can often make these imbalances even worse. So, ideally you would be evaluated by a healthcare professional that can carefully assess your whole system and prescribe specific exercises and stretches that address your individual impairments. However, there is enough commonality and frequency of the tight muscles and weak muscles that I am able to make some recommendations to help readers to started or refine their own self-care.